Now that Selina is out of office, is she out of time? Has the Veep TV show been cancelled or renewed for a seventh season on HBO? The television vulture is watching all the latest cancellation and renewal news, so this page is the place to track the status of Veep season seven. Bookmark it, or subscribe for the latest updates. Remember, the television vulture is watching your shows. Are you? An HBO comedy series, Veep stars Julia Louis-Dreyfus, Anna Chlumsky, Tony Hale, Reid Scott, Timothy Simons, Matt Walsh, Sufe Bradshaw, Kevin Dunn, Gary Cole, and Sam Richardson. One year after losing the presidency, Selina is working to shore up her legacy. Dan (Scott) is trying to get on the good side in his new job. Meanwhile, Amy’s (Chlumsky) D.C. attitude is a bit too much for her new co-workers. On May 25, 2017, Veep was renewed for a seventh season with a start date TBD. On September 6th, it was announced the series will end with season seven which will debut March 31, 2019. Stay tuned for further updates. Last year, Veep was a top ten scripted HBO TV show. As a half-hour comedy, it’s cheaper to produce than big-budget dramas like Game of Thrones and Westworld. This time last year, then new showrunner Dave Mandel said that although he had an endgame in mind, he also had a couple more seasons of stories to tell. Provided HBO and the cast and crew can agree on money, at this point, if you asked me if the Veep TV show would be cancelled or renewed for season seven, I’d come down on the side of renewal. This show is so beloved, I can’t see it ending this year. Subscribe for free alerts on any Veep cancellation and renewal news. 5/25 update: Veep has been renewed for season seven on HBO. Details here. 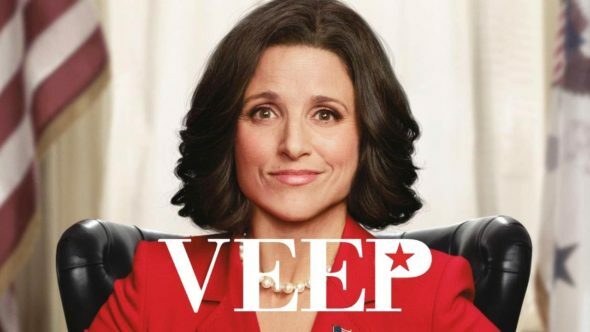 9/6 update: HBO has announced Veep will end with its seventh season. Details here. Find more Veep TV series news or other HBO TV show news. What do you think? Are you happy HBO renewed its Veep TV show for a seventh season? How would you feel if HBO cancelled this TV show, instead? I am so happy I love that show.